Install Eclipse plugins from command line like `nodeclipse install egit` or `nodeclipse update jshint` from eclipse path. Goes well with TCF Local Terminal. See screenshot. Installing from command line is great when your Internet connection is slow or unstable (as p2 Director used under the hood will do several retries when timeout happens) or when you need to automate this process. You can retry again without a lot of clicking and waiting. Also your Eclipse/Enide Studio is not blocked to do other operations. When completed, just restart Eclipse or install more. This tool requires Node.js. Install with npm install -g nodeclipse . List of plugin aliases can be seen using `nci help aliases` or in Nodeclipse plugin list (installed with this entry) Help -> Nodeclipse Plugins ist. If while installing you get errors, that you don't know how to solve, use Eclipse GUI or raise an issue. History: - 0.10.8 add more features; install from .zip; install all - 0.10.9 comma-sep-list of repositories; lookup for repositories. 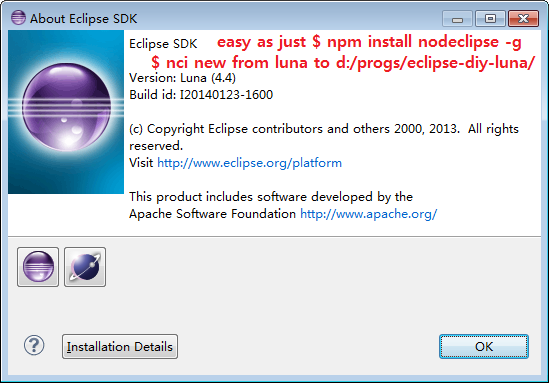 - 0.10.10 uninstall, materialize Examples: `nci uninstall mongodb.shell` , `nci new from luna to d:/progs/eclipse-diy-luna/` - 0.11.0 update command as p2-director needs uninstall then install (example nodeclipse update markdown) Developed in Enide Studio 2014 using Nodeclipse. By adding the following code below to your website you will be able to add an install button for Nodeclipse CLI Installer. This application is configured to run in a cascaded mode only.